Just because they say they met, and they put thought into a project doesn't mean that the right people met at the same time, and the right thoughts were thunk. The issue is not about the number of accidents a place had in the past. Never was. The issue is that a place was already compromised to its efficacy, and could have been improved so that damage to personal property, and town property would be minimized, and that the road could be used as a road, and that sidewalks could be used as sidewalks, not an extension of the road. The right people were not at the right meetings to share the right thoughts, and make the right plan. No amount of past meeting minutes, or drawings of intersections, will ever correct that. All they do is confirm that the plan could have been vastly improved. Instead, we settled. 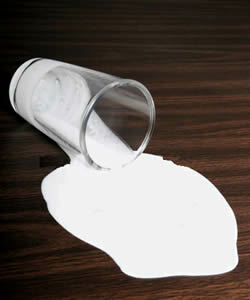 The entire matter is spilt milk now. Next time I hope we'll hold a bit tighter to the glass. I have a broken stair. It's been broken for 5 or 6 years. I have never tripped and fallen because of that stair. Therefore I will never trip and fall on that stair. We talked about fixing it, but went to the movies instead.I am now happily going down those stairs - oh, here comes my football player kid, coming up the stairs. "How ya doin', Kiddo? Good to see...Oh! Help, I've fallen and I can't get up!" HUMANS: Stay off the sidewalks when you are aware that large vehicles are coming. LARGE VEHICLES: Stop if there are humans in the area. If clear, proceed over the sidewalks with caution. LARGE VEHICLES:Scan sidewalks for flattened humans. If sidewalks are clear, proceed with caution. If flattened humans are detected, honk three times, and stop, honk three times and stop, honk three times and stop until help arrives. HUMANS: If you notice flattened pedestrians, yell loudly, until help comes, "Flatman down! Flatman down!" Other than sidewalk removal, it's the best cheap fix I can think of right now.